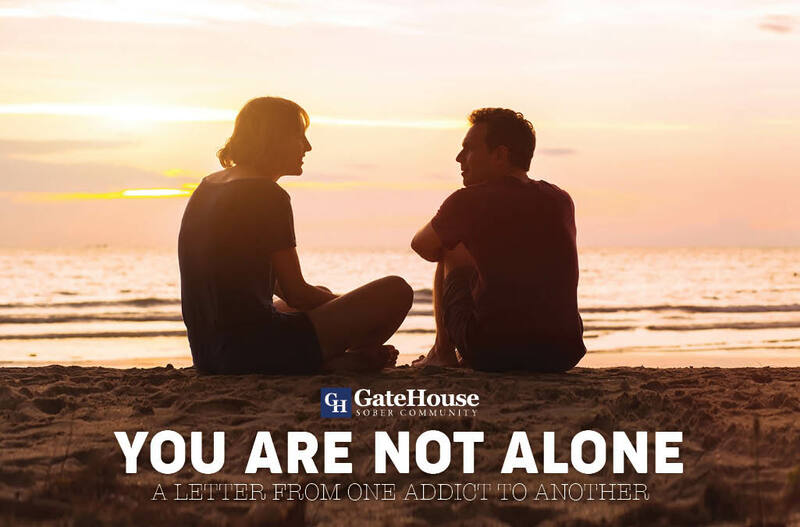 You’re not Alone – From one Addict to Another | GateHouse Sober Community You're Not Alone. From One Addict to Another, I Understand Your Struggle. Addiction is isolation, despair, and escapism. It is feeling like a stain wherever you go, not being understood and feeling alone. No matter what the substance, we feel like there is no other way. How can we get through the day without being numb from ourselves? How are you supposed to deal with life when you can’t face yourself in the mirror? In the darkest moments of addiction, you don’t see a way out. Resignation to this disease seems to be the only option. In the literature, it says, “We are people in the grip of a continuing and progressive illness whose ends are always the same: jails, institutions, and death.” We accept that as our fate. We will bow down to the one thing that offered us salvation from ourselves, until it took away any peace we ever knew. It’s hard when a voice in your head that sounds exactly like your own telling you that you will never be anything but an addict. You do anything to appease that voice, to make it silent for a second, a minute or forever. The only way we know how to do that is to keep using. Keep going, a slow suicide through addiction. How can there be any other way? All these questions and doubts swirl in our heads. “How can I possibly get through this?” “How did this happen to me?” “Who am I without drugs and alcohol?” “I don’t know any other way.” You are not alone. There is always someone going through what you are. There is another person who feels or has felt the same way you do. That is the beauty of the recovery fellowships. We have people we ran with, dealers, favorite bartenders, or cop spots in addictions. Those are our measures of comfort, that was what we turned to when we felt alone. We have been stripped of those things. Where do we turn to now? Beware of the voice in your head. It is a smooth talker and can take you back out the longer you talk to it. Don’t let that frighten you though; you’re not alone. You have people around you who will listen. They have been there, they have walked through those days and can help you walk through them. When we stop trusting the voice in our head that has almost killed us, we can listen to others. Listen to their experience, strength, and hope. Listen to whatever higher power has gotten us this far and realize that we do have a purpose. You are never alone, and you never have to feel like you are again. “Tell your friend who is struggling with this that you love them no matter what and then show them that you do. It may not seem like much, but more often than not, it can be the difference between someone picking up and using that day or deciding to wait. To not do it today. To live.” The voice in our heads isn’t going to tell us anything other than to give up. “All it wants is for you to consume, to try and fill a black hole that is insatiable beyond anything you can imagine.” We know that story all too well, try something different. Choose to live. If you are struggling with substance abuse or know someone who is, reach out to us today at 855-448-3638. We are here; we have walked the path that you have. You’re not alone, and we will be here for you.